'The Annexe' is a very pleasant one bedroom apartment at one end of a large family house at the top of Solva village. The beautiful harbour, beach and coastal path are within easy walking distance. 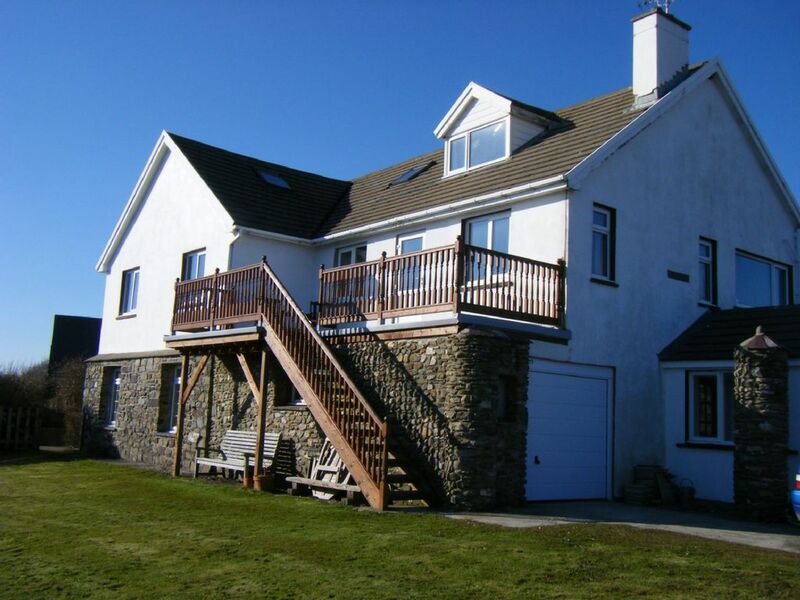 'The Annexe' provides a comfortable base from which to explore the spectacular and varied Pembrokeshire Coastline. It has the perfect combination of being a very quiet and peaceful location and yet within easy reach of all you need for a weeks stay. If you choose, there is no need to use your car for your entire stay. There is also a very efficient coastal walking bus service for those of you who want to make the most of the wonderful Pembrokeshire Coastal Path. 'The Annexe' forms part of a large family house right at the top of Solva village. It's atmosphere is compact and tasteful, providing the visitor with all the comforts of home in lovely surroundings. The accommodation is on the ground floor and would be suitable for someone who is slightly disabled - with one small step over the threshold. The main part of the house enjoys views out over St Brides Bay but this is not quite visible from 'The Annexe' windows. The village with shops and post office is 5 minutes walk away down a fairly step road. The entrance is secluded with a patio area complete with garden seating and flowering tubs. There is a conservatory which catches the sun most of the day and where it is lovely to eat meals or just use as an extra room in which to relax. The main sitting room has a two seater settee and a single comfy chair. There is a also a television with DVD player as well as a CD player with Ipod docking. Adjoining the sitting room is a compact kitchen which is fully equipped with an electric cooker, microwave oven etc which as new in 2016. The bathroom has been totally refurbished in 2018 and now has a large walk-in shower (no bath), built in basin, W.C., heated towel rail and washing machine. 'The Annexe' is just the right size and location for one couple - unlike some properties which claim to be in Solva but in fact are some distance away from the village. 'The Annexe' is perfect for exploring Solva and the surrounding area and of course the Pembrokeshire Coast Path. - Friendly village atmosphere - Fabulous coastal scenery - No need to use your car once you have arrived unless you want to explore further afield. toilet, shower, New bathroom Feb 2018 with modern walkin shower and no bath. As from February 2018 are happy to offer our totally refurbished bathroom with a modern walkin shower and no bath. Washing machine is built-in under the airing cupboard. Bath and hand towels are provided but please bring your own beach towels. Only a clothes airer/rack in the apartment but you are very welcome to use our outdoor washing line. New kitchen installed for 2016 season. The folding out dining table can be used either in the sunny conservatory or taken into the kitchen or sitting room area if the weather is cooler in the low season months. You are welcome to use the shared lawned area in front of 'The Annexe' which catches the sun for most of the day. We ask that if you have a dog that it be kept on a lead when using the lawned area.. The apartment is very convenient for the less able. However there are five steps up from the parking area with no hand rail. It is possible to bypass the steps and access The Annexe front door via a level lawned area. For those wanting a base from which to explore the incomparable National Park Pembrokeshire coastal path, look no further! Solva is a perfect location for enjoying the beautiful Pembrokeshire Coast. The annex is comfortable and perfect for a couple, the conservatory is ideal for dogs. Thanks penny and Mike. Warm and well equipped little cottage for two. We spent a week here over Christmas. A good situation with easy access on foot down to the village, harbour , and to cliff walks. We were lucky with the weather for visiting St Davids, beaches, and walking on the coastal path, after which we were very happy to return to the comfortable sitting room. The village of solva is situated about 3 miles before the Western most point of South Wales ie St Davids. The nearest largish town is Haverfordwest,12 miles East. Our apartment is very close to the incomparable Pembrokeshire Coast Path. Other Activities: Fast & exciting or slow and leisurely boat trips around the islands. Fishing trips from Solva Harbour.